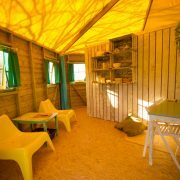 This 5 person hexagon shaped ‘Glabana’ (glamping cabana) on our small scale holiday resort in Portugal has its own kitchen and bathroom and is well equipped. 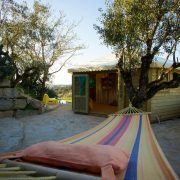 The glamping accommodation is wonderfully situated on a terrace of natural stones between some of our old olive trees. 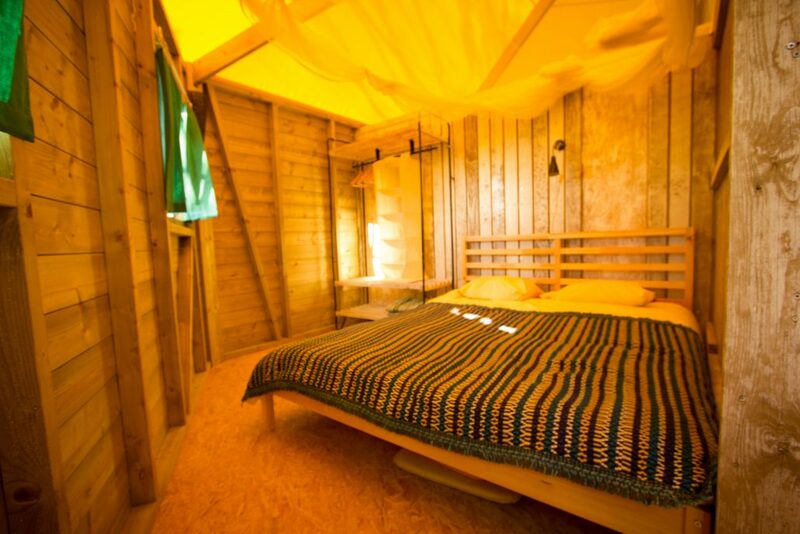 You will find lots of tranquility for yourself and plenty of space for the kids to play. 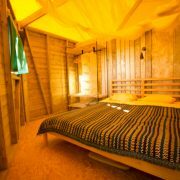 This wooden ‘Glabana’ with tent roof combines the ruggedness of a safari tent with the charmes of a yurt and the comfort of an apartment. 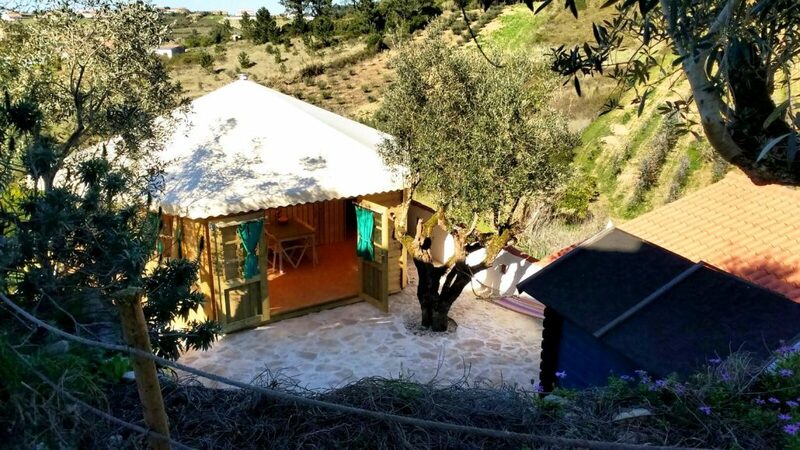 The accommodation is nice and spacious with a surface of 32 m2 and with the sides being 2.20 meters high and a roof ridge of 3.5 meters in height it is high enough to stand up everywhere. 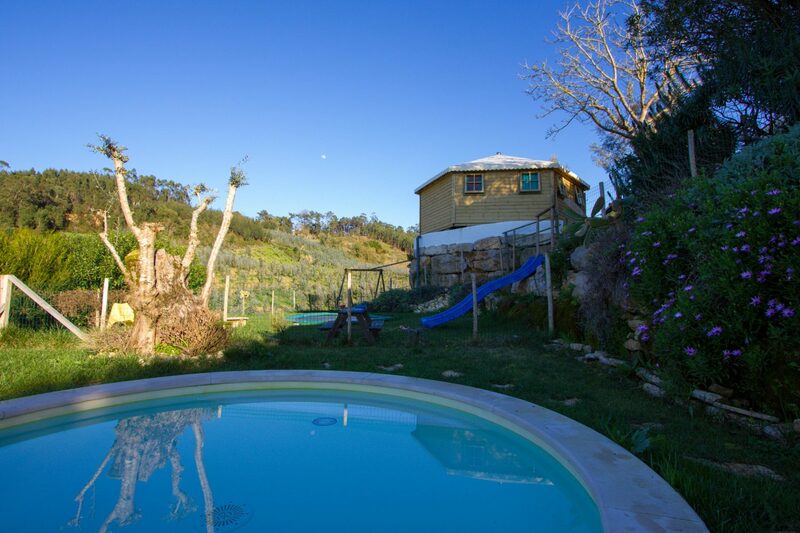 The holiday accommodation is situated on a comfortable wooden surface and is setup tastefully. The glabana is separated into three rooms. 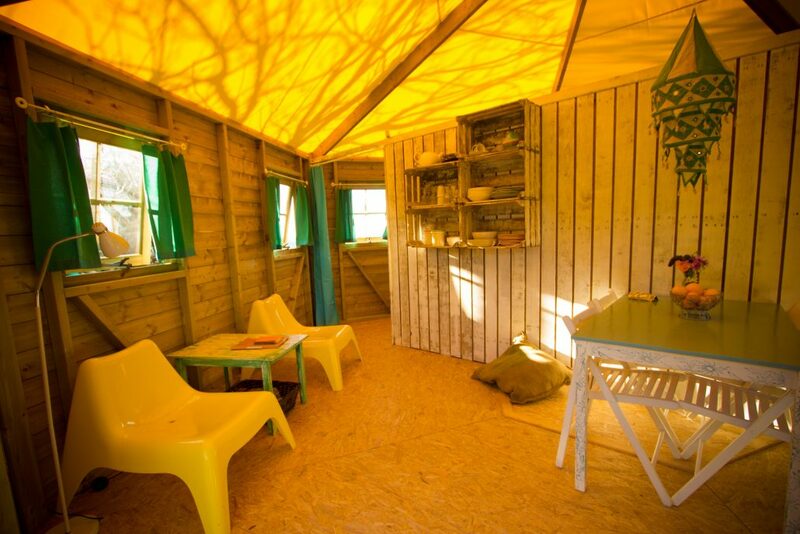 Every compartment has several windows so there is plenty of light and it is easily ventilated. 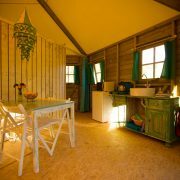 The front half of this glamping accommodation consists of the living area with dining table, sitting corner and kitchen. The back of the glabana is divided into two separate bedrooms. 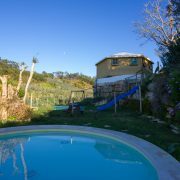 Ideal for a family holiday with the kids. 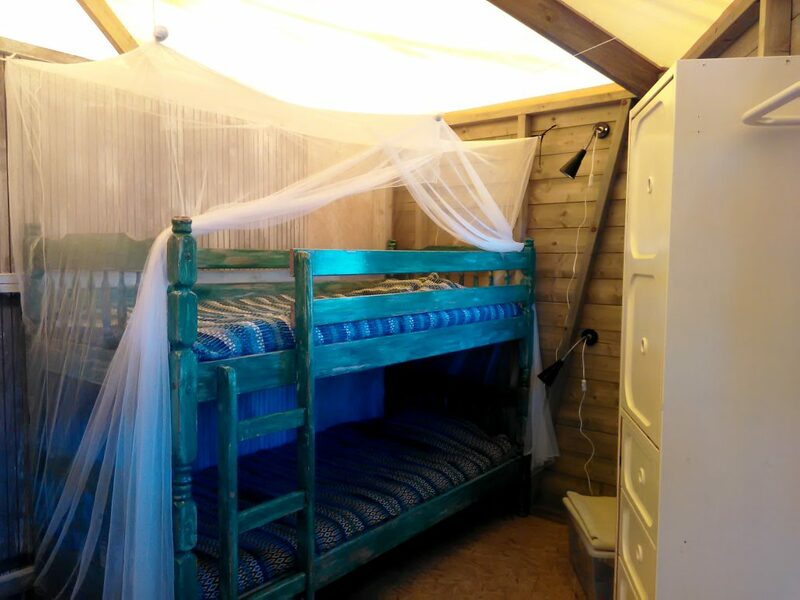 The master bedroom has a double bed (1.60 x 2.00) and the kids room has three beds: one bunk bed and a stretcher to be deployed for a possible fifth person. Instead of this stretcher we can also add a baby cot to this glabana (baby package). 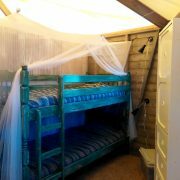 All beds are equipped with a mosquito net. 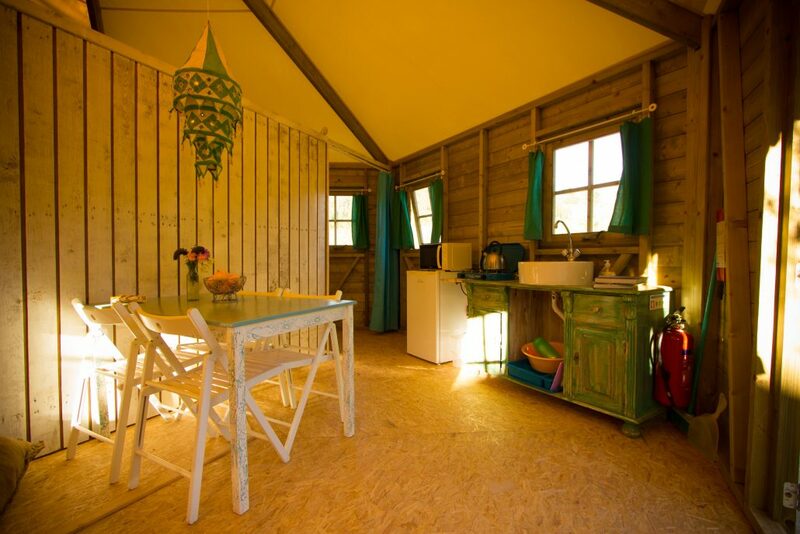 This glamping accommodation has a private bathroom with toilet, shower and sink. 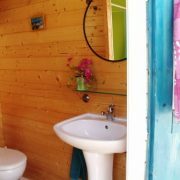 The bathroom can be found in the little blue outhouse on the terrace. Obviously the bed linen, towels and kitchen linen are included just as in our other accommodations. Cooking can be done in the kitchenette in the living space of the glabana. 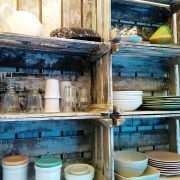 Of course gas burners, cooking utensils, kitchen and table ware can be found here as well as a microwave oven and a kettle. 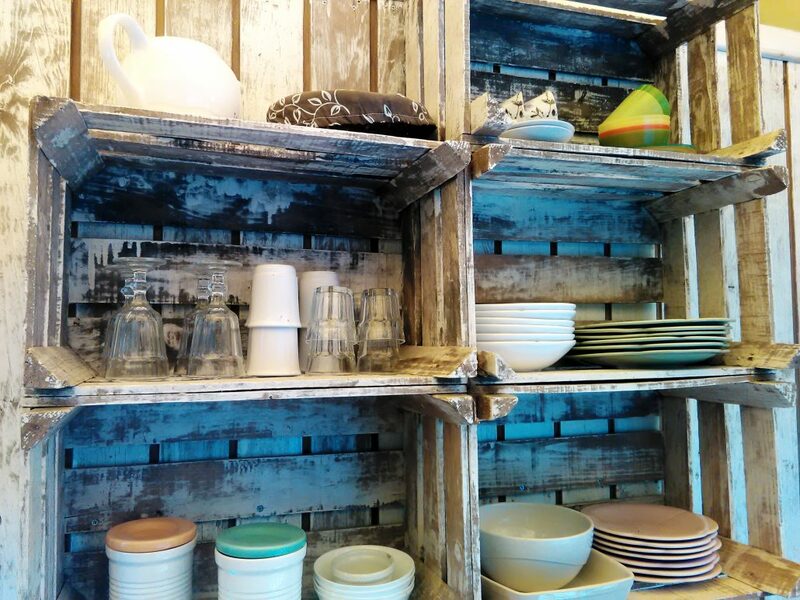 The dishes? They can be done right in the glabana as the kitchen sink furniture has both cold as well as hot water. 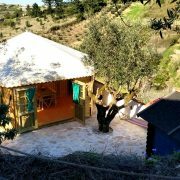 Olival is Portuguese for “olive grove” and around the terrace of this glamping accommodation you will find several old olive trees. The private terrace is nice and spacious and is situated on a plateau surrounded by rustic natural stones. 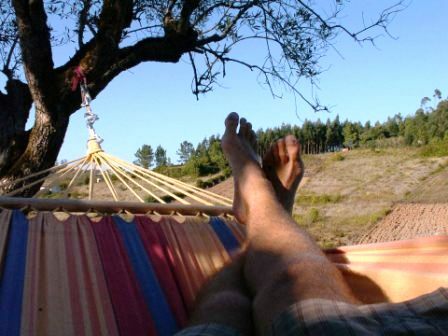 Because of this there are several nooks, privacy and a wonderful view on the Portuguese farmlands. 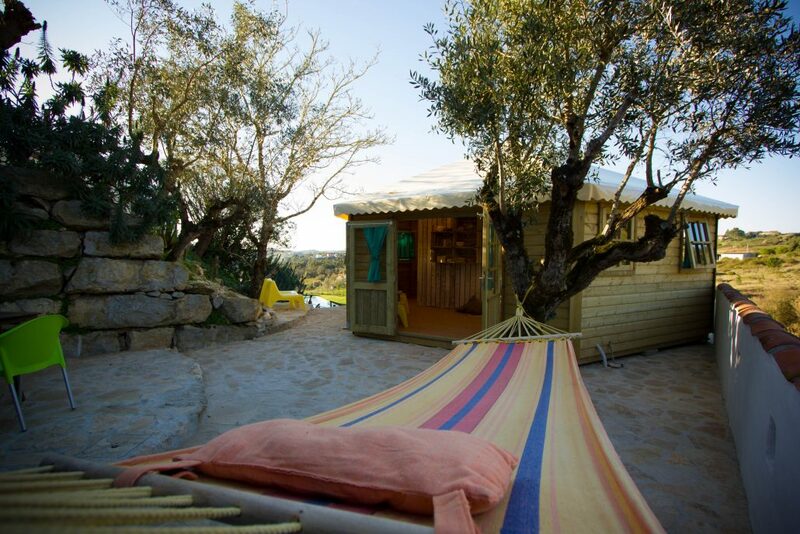 On this terrace you’ll not only find the outhouse bathroom but also a spacious table, hammock for dreamy moments and two lazy chairs in the shadow of a walnut tree. The high edges of the natural stone are fenced of for the kids. 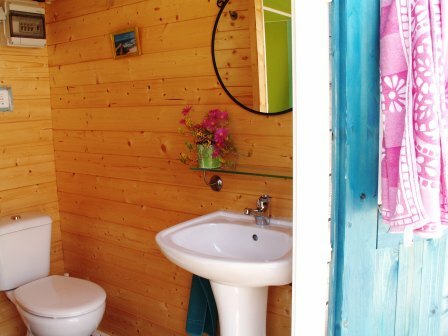 In this glamping accommodation and the bathroom outhouse you will find plenty of wall sockets. Should it get fresh outside the summer months, a gas heater can be rented that will get your glabana nice and warm in no time. 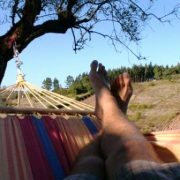 A Wi-Fi connection can be used for free in and around the accommodation with your own devices.